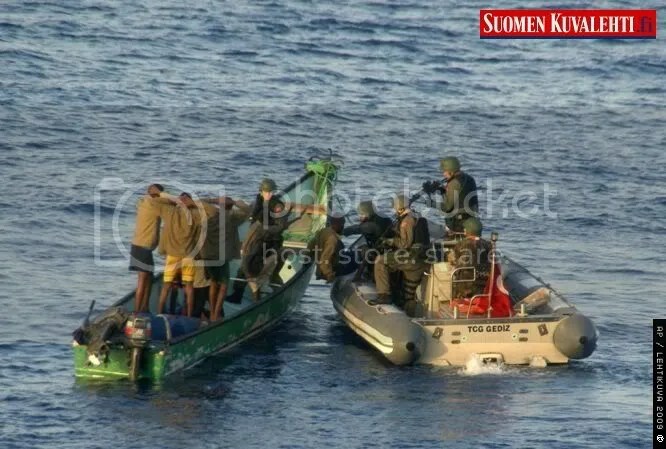 In this photo released by the Turkish military, Turkish commandos are seen with seven pirates in the Gulf of Aden, off Somalia, Saturday, Sept. 26, 2009. The Turkish military said Saturday navy commandos aboard the Turkish frigate TCG Gediz, part of a NATO force patrolling the seas, have captured seven pirates. Commandos raided the skiff, left, Saturday morning upon a request to block it before it could attack a ship. It says a navy helicopter aboard a Turkish frigate also took part in the operation. Turkey’s military says navy commandos aboard a frigate have captured seven pirates in the Gulf of Aden off Somalia’s coast.